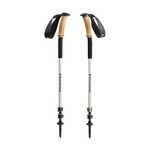 Trekking poles designed for the weight-conscious trekker. 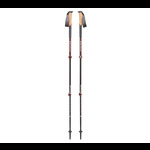 Built for fast and light missions on the trail, the Distance Carbon AR trekking poles are your multi-functional adventuring companions that feature an Accessory Ready grip, designed to receive a connecting component that transforms the Distance Carbon AR’s into the structure poles for its fast and light hiking companion, the Distance UL Shelter. Featuring carbon construction, the Distance Carbon AR’s weight is minimal, while the poles’ adjustability comes from Black Diamond award winning, tried and true FlickLock design. So, whether you’re looking for a lightweight pair of poles to hit the trail, or you’re taking full advantage of the Accessory Ready grip by pairing them with the Distance UL shelter for overnight adventures, the Distance Carbon AR’s are ready for any mountain mission. Accessory Ready grip is compatible with Distance UL Shelter (sold separately). Usable length: 105 - 125 cm.